The weather is cool but high school fishing in Louisiana is heating up. Daniel Brown tells us anglers in the area are excited about the future of the sport. This entry was posted in KTBS on December 20, 2018 by captains. Coming out of middle school, Darrius Grant had some options about where to attend high school and advance his love of football. That’s not unlike most of the kids in the Caddo Parish School District. Loyola, Byrd, Captain Shreve — Grant opted for the Gators after some prayerful consideration and direction from coaches he trusted. “It was a good decision,” said Grant, who will quarterback the Gators against Class 5A’s top-seeded West Monroe Friday night at 7 p.m. This entry was posted in Times on November 16, 2018 by captains. A Navy veteran with a Shreveport connection has returned to town to share his love of the service during Navy Week. Commander Robert Lightfoot was born in Michigan but graduated from Captain Shreve High School. He’s the commanding naval officer of the USS Laboon, a destroyer based in Norfolk, Virginia. He has fond memories of his time in Shreveport. Observing Navy Week in landlocked Northwest Louisiana may seem odd, but Shreveport-Bossier City is one of 14 places nationwide taking part in the Navy’s outreach program. Navy members participate in community projects and offer a glimpse of Navy life during the event. This entry was posted in KTBS on November 1, 2018 by captains. Captain Shreve volleyball player Kayla Jenkins is The Times Athlete of the Week for the week ending Oct. 21. Jenkins received more than 44 percent of the nearly 8,700 votes cast in the poll. Ruston volleyball player Meg Roeder was second with more than 31 percent of the vote. Jenkins had three aces, six kills, three blocks, one assist and three digs last week. This entry was posted in Times on October 26, 2018 by captains. Many high school students are known to have a lack of discipline or respect. Well not with this particular individual. Shakonna Sudds is a preacher’s daughter who has always kept her grades up. JROTC became the source for her fiery passion for structure her freshman year. She has even won Cadet of the Month, she recalls winning it because, “she had her head screwed on right.”, she said. This entry was posted in Gator Press on October 18, 2018 by captains. Cross country is all about running. There is no score board or a ball that needs be placed in a goal. It only requires a willing participant and a decent pair of shoes. With that in mind, cross country is one of the most student involved sports in the nation and running is something that all humans have in common. Coach Cary Hilburn and his daughter, Georgia, have been running for most of their lives and have no plans to stop. “I plan on sticking with running, for sure.” Georgia said. This entry was posted in Gator Press on October 13, 2018 by captains. 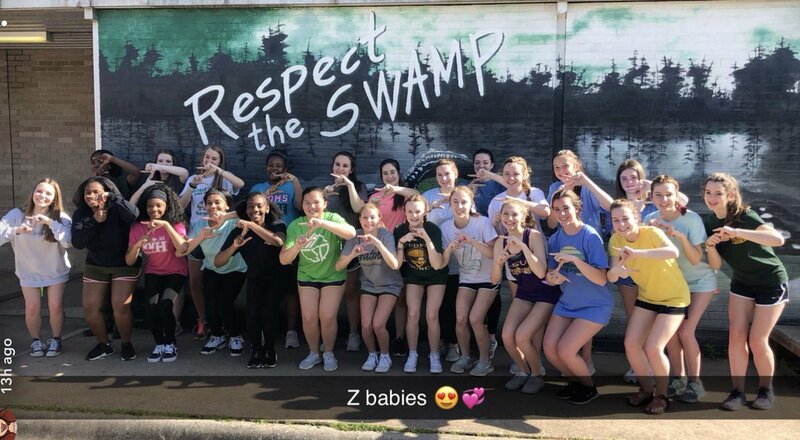 For all the blustering, flustering and hectoring associated with Byrd-Captain Shreve week we sometimes forget there are relationships that transcend a rivalry that’s been known to bring out the worst in one side or the other. Consider the case of Captain Shreve senior Cade Davis and Byrd senior Nick Erwin – two guys who couldn’t be more dissimilar or more alike. Cade is tall, lean and favors the Gator nation, while Nick is shorter, stocky and inhabits the City of Byrd. Nick is active at Broadmoor Methodist, Cade does his praying at Broadmoor Baptist. Nick lives in Blanchard driving in a long way to attend Byrd, while Cade has a relatively short trip from off the Southern Loop to Shreve. More later on their unlikely friendship that isn’t expected to end anytime soon. Davis and Erwin face off for the final time Thursday night at Lee Hedges Stadium during a District 1-5A showdown that will undoubtedly be worth attending. This entry was posted in Times on September 27, 2018 by captains. GatorPress – Student ID’s: Help or Hindrance? Schools all over the country are turning to student ID’s as a safety feature, and now Captain Shreve is one of them. Although wearing an ID may seem unnecessary or annoying, it all makes sense once you understand the reasoning behind it. Shreve initiated the process last school year, when a group of teachers, administrators, and parents met several times with Roy Murry, the director of security for Caddo Parish. Mrs. Gustavson understands that the new policy will take some getting used to, but she feels that the benefit is definitely worth it. This entry was posted in Gator Press on September 12, 2018 by captains. This week’s Landers Dodge Chrysler Jeep Ram Athlete of the Week, one of the top incoming freshmen, has a name for himself even before transitioning from the track to the high school football field. This entry was posted in KSLA on August 10, 2018 by captains. About a dozen Captain Shreve High students will start the seminar portion the AP Capstone program this fall. Another nine will move on to the research portion. This entry was posted in KSLA on August 2, 2018 by captains.